Winged scapula refers to a shoulder blade that sticks out like a wing. True scapular winging is a rare disorder that results from nerve injury and the associated weakness of the shoulder blade muscles. 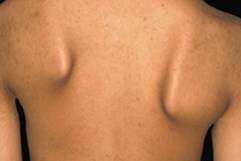 Prominent shoulder blades in infants and toddlers and individuals with the skinny body, poor posture with rounded shoulders, unbalanced muscle building, scoliosis or kyphosis, in most cases, are not examples of true winged scapula and do not cause any problems. Winged scapula can present without any pain or other symptoms. The winging may become apparent only several weeks after an injury . In medial scapular winging, the medial border of the scapula sticks out, the scapula is elevated and displaced medially (Picture 1, Video 1); the forward arm lifting above the shoulder level is limited . 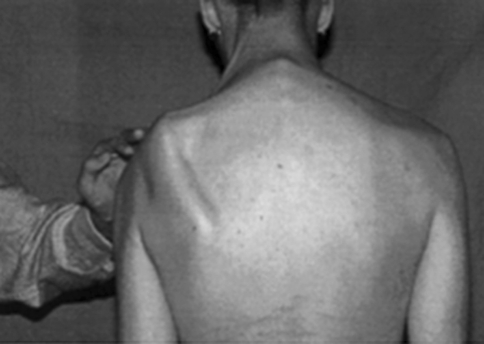 Bilateral scapular winging can occur in a rare hereditary disorder facioscapulohumeral muscular dystrophy (FSHD) (Picture 2) . In lateral scapular winging, the superior angle (in trapezius palsy, Picture 3) or the inferior angle (in rhomboid palsy) of the scapula is displaced laterally . Medial scapular winging usually results from damage to the long thoracic nerve and the associated weakness of the serratus anterior muscle. Repetitive arm stretching in athletics, gymnastics, boxing, weightlifting, baseball, swimming, garden digging, etc. A doctor, usually an orthopedist, can recognize winged scapula during a physical examination (Picture 4). Picture 4. A wall push-up test for winged scapula. Stand 2 feet from a wall, lean toward it and press against it with your hands . Note a winged right scapula vs. normal left scapula. Electromyography (EMG), nerve conduction tests and neuromuscular ultrasound can help to identify the affected muscles and nerves [3,17]. To reduce pain, apply an ice pack to the shoulder blade for 10-15 minutes few times a day and avoid overhead arm activities [1,7]. Transcutaneous electrical nerve stimulation (TENS), nonsteroidal anti-inflammatory drugs (NSAIDs), narcotic analgesics, steroid injections, nerve blocks and acupuncture probably do not reduce pain significantly [7,13]. Surgery can be considered when the symptoms do not improve with conservative treatment in 12 months after a traumatic cause or 24 months after a non-traumatic cause [8,9]. The release of the long thoracic nerve (neurolysis) has had excellent results, so far [7,14]. Transfer of the pectoralis major muscle from the humeral head to the inferior angle of the scapula can be effective in physically less active individuals . Fixation of the scapula to the ribs by wires (scapulothoracic fusion) is considered a palliative treatment and results in a limited range of motion in the shoulder . A shoulder orthosis may help in damage to the accessory nerve after neck surgery . Physical or chiropractic therapy probably do not help [7,13]. The release of the accessory nerve can be effective if performed within 20 months of injury. Transfer of the insertion ends of the levator scapulae muscle to the acromion or the rhomboid muscles to the infraspinatus fossa of the scapula (the Eden-Lange procedure) is often effective but less likely after nerve damage caused by neck surgery. In true scapular winging due to nerve injury, you should rest the affected muscles; you should avoid sports, most of the physical work, raising the arm on the affected side above the shoulder and carrying backpacks until full recovery . Symptoms usually resolve spontaneously or with conservative treatment within 9 months of traumatic and within 24 months of non-traumatic injury [2,10]. Recovery after surgery may last from few weeks to 6 months . Recovery is often incomplete. Common complications are permanent scapular winging and decreased range of motion in the shoulder .